For a long time, Canopy has had the benefit of using a tool called sofe inspector (note: this is an out-of-date version of it) to list, override, and interact with single-spa applications. There has always been a desire to figure out how to share this tool so others can benefit as well. With that in mind, I'm proud to announce an initial release for single-spa Inspector! single-spa Inspector is a Firefox and Chrome extension, much like React/Vue devtools, that allows you see and interact with your single-spa applications and configuration. The single-spa Inspector will only work with single-spa versions 4.1 and higher, since we had to expose and add some functionality to the single-spa library itself in order to implement these features. We also changed our test suite to purely use Jest instead of Saucelabs, and hopefully false positive "failing" tests on pull requests will be a thing of the past. If you would like to suggest a new feature for single-spa Inspector, report a bug, improve our (admittedly horrible and hopefully temporary) UI/UX, or add features, please see the github repo and hack away! And with the release of version 4, I’m pleased to announce that single-spa is expanding that effort so that individual components written with different frameworks can interoperate. It is new terrain for the single-spa community, which previously had focused on getting large applications to interoperate with each other, instead of the individual components. Another way to do framework agnostic components? And as one of the contributors to the custom elements polyfill, let me be the first one to say that we did not make this decision lightly. If you’re interested in diving into the details, check out One Company’s Relationship With Custom Elements, which explains some of the difficulties we’ve been through with web components and custom elements. TLDR: React and some other frameworks don’t interop with custom elements very well. Additionally dealing with inner html, attributes vs properties, and customized builtins can be a pain. A parcel is single-spa’s way of building a component in one framework and using it in another. Once you’ve implemented the parcel config, simply call singleSpa.mountRootParcel(parcelConfig, parcelProps) to mount it. This is the key to what makes parcels framework agnostic — regardless of whether the parcel config is implemented with React, Angular, Vue, or anything else, to use the parcel you always just call mountRootParcel(). How do you implement the lifecycle functions on the parcel config? Use a helper library for your framework of choice. [single-spa-react](https://github.com/CanopyTax/single-spa-react), [single-spa-angular](https://github.com/CanopyTax/single-spa-angular) (for angular@2+), [single-spa-angularjs](https://github.com/CanopyTax/single-spa-angularjs), [single-spa-vue](https://github.com/CanopyTax/single-spa-vue), and [others](https://github.com/CanopyTax/single-spa/blob/master/docs/single-spa-ecosystem.md) will implement the entire parcel config for you. What are the props you pass to mountRootParcel()? The props passed as the second argument to singleSpa.mountRootParcel(parcelConfig, parcelProps) are an object with one required prop and as many custom props as you’d like. The required prop is domElement, which tells the parcel where to mount. And the custom props get passed through to the parcel config lifecycle functions. How do you re-render and unmount a parcel? The singleSpa.mountRootParcel() function returns a parcel object that lets you re-render and unmount the parcel whenever you’d like to. Calling all of those functions manually might get annoying. So let’s make it easier. Here’s an example of some syntactic sugar for React. Similar features will be added soon for Angular, Vue, and other frameworks. How hard is it to try this out? You can get started with parcels immediately, without using the rest of single-spa. To do so, either npm install or script tag single-spa, then call mountRootParcel with your first parcel config. You can also check out this codepen example to start out. And if you are already a user of single-spa applications, parcels mean that your applications can mount and unmount shared functionality whenever you want them to. Since parcels don’t have activity functions, you don’t have to set up routes for them. We’d love to get your feedback on parcels. What do you think of this new way of framework interop? Is the implementation easy to understand? Are parcels useful for you or do they not quite fit into what you’re trying to accomplish?How hard was it for you to try out? Check out the official docs for more examples, explanations, and api documentation. And let us know your thoughts in the single-spa Slack channel, a Github issue, or on Twitter! This blog post will take you through setting things up and what choices you have when using single-spa. It’s based on what I’ve seen at Canopy Tax where we went from an Angular 1 monolith to an Angular 1, React, and Svelte polyglot. 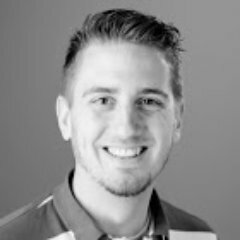 If you’d like to jump straight to a fully working, self contained code example, check out this webpack single-spa starter project. Step One: choose a module loader. Your module loader / bundler is the library you’ll use to lazy load code. I recommend either Webpack or JSPM, if you’re starting from scratch. If you go with Webpack, try to use Webpack 2 if you can, since it has support for promise-based lazy loading. This will make things easier for you later on, since single-spa requires that your loading functions return promises. If you can’t use Webpack 2, getting single-spa to lazy load your code with Webpack 1 will require some boilerplate code. JSPM/SystemJS has worse documentation than Webpack, but is a great solution for module loading if you can get past that. I recommend using jspm@0.17 — it’s still in beta but has been worked on for over a year and at Canopy we find it stable enough to use in production. If you’re struggling to decide between the two, then ask yourself the following: Do I want multiple completely separate bundles? If you don’t, I recommend Webpack because it has better docs, a larger community, and fewer gotchas. Otherwise, I’d go with JSPM, since Webpack has no plans to support dynamic runtime loading (See tweet below from Mr. Larkin, himself). The next step is to create what single-spa calls your “root application.” Really your root application is just the stuff that initializes single-spa, and it starts with an html file. Even if you’ve got an existing project that already has it’s own html file, I recommend starting fresh with a new html file. That way, there is a clear distinction between what is in your root application (shared between all apps) and what is in a child application (not shared with everything). You’ll want to keep your root application as small as possible, since it’s sort of the master controller of everything and could become a bottleneck. You don’t want to be constantly changing both the root application and the child applications. Since Webpack is probably the more common use case, my code examples from here on will assume that you’re using Webpack 2. The equivalent Webpack 1 or JSPM code has all the same concepts and only some minor code differences. Now it’s time to finish up your root application by writing your “root-application.js” file. The primary purpose of root-application.js is to call singleSpa.registerApplication(..) for each of the applications that will be managed by single-spa. If you’re into analogies, you can think of single-spa as the operating system for your single page application, managing which “processes” (or “child applications”) are running at any given time. At any moment, some of the child applications will be active on the DOM and others will not. As the user navigates throughout the app, some applications will be unmounting from the DOM and others will be mounting to the DOM. Another way to look at it is that single-spa is a master router on top of your other routers. // This is a "loading function"
// This is an "activity function"
Because single-spa is so very cool, we’ve created an app called “cool-app” that will be lazy loaded and mounted to the DOM whenever the url hash starts with #/cool. The loadCoolApp function is what single-spa calls a loading function. Inside of it, the import introduces a code splitting point — Webpack will create separate code chunks that will be lazy loaded by single-spa. For your specific project, you probably won’t have a hash prefix of “cool”, but I recommend establishing some kind of convention that makes it easy to determine which apps are active. This will simplify the maintenance of your activity functions, as you add more and more child applications. If you’re going to start out with just one child application, then it might make sense to implement the activity function as () => true. You can worry about getting fancier once you have more than one application. The last thing is to call start(). This is something you must do for things to work. The purpose is to give control over timing and performance. But until that is a concern, start is just one of those things you do, and then maybe read about it later if you ever need to. When you open up your index.html file in the browser, you’ll now see….. a blank screen! We’re really close, but there’s one crucial step left: building your app.js file. After that, you’ll have everything working for your first single-spa application. An app.js file is a configuration file that you create for each child application. It is the code that is lazy loaded when your activity function returns true. A “lifecycle” is a function or array of functions that will be called by single-spa; you export these from the app.js file. Each function must return a Promise so that single-spa knows when it is completed. * can implement a "mount" and "unmount" to become a single-spa application. At this point, you might be seeing the document.getElementById and innerHTML = and worry that you’ve been duped — maybe single-spa is really just a poor excuse for a ui component framework. And really, don’t we already have a lot of different ways to write UI components? Getting all of those frameworks to work together. Using multiple frameworks is where single-spa really shines. It is not a ui framework itself, but a framework for using other frameworks. Each child application can be written in any framework, so long as it implements application lifecycle functions. Then the mini-apps cooperate to form the entire single page application. In this example, we use a helper library called single-spa-angularjs which abstracts away the specifics of initializing Angular 1 apps. This blogpost doesn’t show you the app.module.js or routes.js files, but you can see an example implementation here. The pattern is to call singleSpaAngularJS at the very beginning, which returns bootstrap, mount, and unmount lifecycle functions for you. You might notice that this time the lifecycles are exported as arrays of functions instead of just functions — you can choose whichever works best for you. The advantage of exporting an array of functions is that you can add in your own custom behavior (like aboutToBootstrap and doneBootstrap) that will run before or after the Angular 1 lifecycles. When you export an array, each item in the array must be a function that returns a promise. Single-spa will wait for each promise to resolve, in order, before calling the next function in the array. You can also see a fully working example of an angular app coexisting with other apps at the single-spa-examples repo or the live demo. Step Five: test it out! Refresh your page and you should now have a functioning single-spa application! Try navigating to a url that your child app is active for (#/cool) and then navigating away from it. When you do so, the page will not refresh but you should see your application mount itself to the DOM and then unmount. If you run into problems, try to narrow down whether the problem is in the root application or in the child application. Is your root application being executed? Are the declareChildApplication calls being made? Have you called start()? Is there a network request to download the code for your child application? Is your child application's bootstrap lifecycle being called? What about mount? It may be helpful to add a navigation menu, so you can verify everything mounts and unmounts to the DOM correctly. If you want to level up your single-spa skills even more, make the navigation menu an entire child application whose activity function is () => true. An example that does just that is found here and here. Conclusion As you get your feet wet, you’ll probably run into some (hopefully small) hiccups setting things up. When this tutorial is not enough, there are other resources on Github and here in the docs. Single-spa is still a relatively new thing, and we’d love to hear your feedback and questions. We welcome contributions from everyone. The company is growing and you are looking for ways to scale the team and code-base. You add unit tests. You add a linter. You add continuous integration. You modularize the code with ES2015 modules, webpack, and npm. Eventually you even introduce new, independent SPAs with each SPA being owned and deployed by independent squads. Congratulations, you have successfully introduced service-oriented architecture on the front-end, or have you? Contrast a service to a shared library. A shared library is a piece of code that is bundled and deployed with your code. For example, libraries such as Express, Lodash, and React are all shared libraries included in your application’s distributable. Upgrading a version of a shared library requires a new deployment of that distributable. Service-oriented architecture is an approach to building software where the application is composed of many independent and isolated services. Those services are independently deployable, generally non-versioned, and auto discoverable. 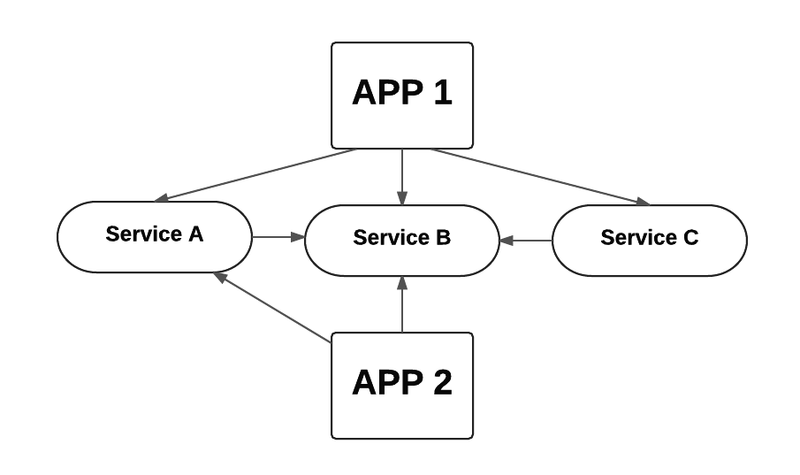 Why Service-oriented Architecture on the Front-end? The benefits of SOA can be illustrated with this real life example from Canopy. At Canopy we have multiple single page applications. The first application is external to the customers and the second is internal, yet both applications share common functionality. That functionality includes among other things, authentication and error logging. Shared libraries between two separate applications. 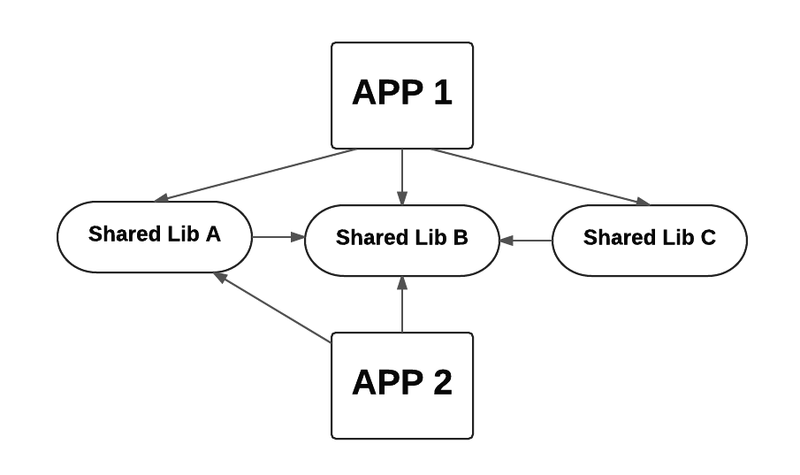 App 1 depends upon shared libs a, b, and c. App 2 depends upon only shared libs a and b. Overall the design looks good. The code is modularized and shared. The complexities arrive when we start to upgrade the code to different versions. For example, after a short period of time, App 2 (being internal only) is upgraded to a new beta version of the shared lib b. Because the shared a also depends upon b (and we don’t want multiple versions of b bundled) we also create a new version of a. 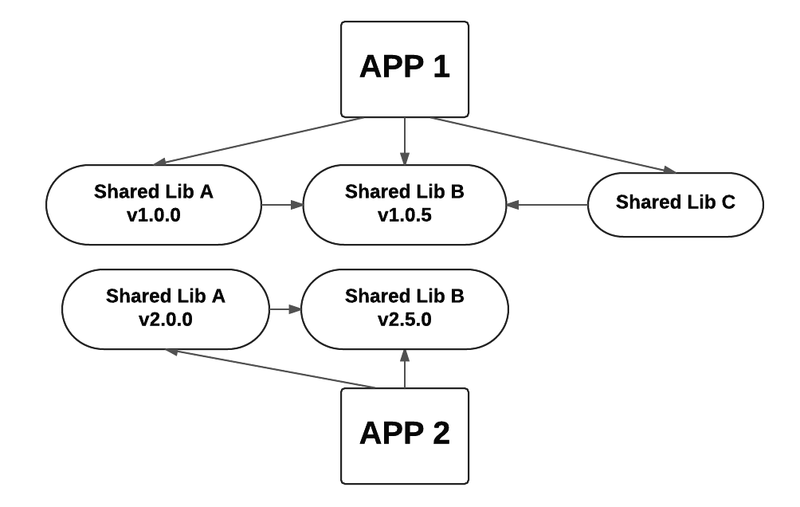 This one change causes a rebuild and deploy of three separate pieces of code: App 2 and shared libs a and b. Our dependency structure is no longer quite so simple. In reality, a duplicate instance of lib a and b exist in both apps. Each app does not point to the same instance of the shared libraries, even when they are the same version. This is more noticeable when the shared libraries have separate versions. Now imagine a bug in both versions of shared lib b. In order to fix the problem, you will have to republish both versions of a and b as well as c. Also App 1 and App 2 will have to be re-deployed. That is five new versions to publish and two apps to redeploy, all to fix one bug. All downstream dependencies have to be redeployed when a single library is changed. This is deploy dependency hell. Service oriented architecture avoids these problems in a couple ways. Instead of bundling common dependencies, common code is shared through independent services. Services are not bundled, but rather loaded at run time. This also means that front-end services are not versioned (just like a back-end API). Both App 1 and App 2 load the exact same code for a front-end service. You can load a sofe service either with static or asynchronous imports. The real power behind sofe is that services are resolved at run-time, making them unversioned. If auth-service is redeployed, it is immediately made available to all upstream dependencies. The above scenario becomes much easier to resolve because there is only one version of each shared library as services. This is powerful because it allows you to deploy once, update everywhere. Also because the code is loaded at run-time, we can also enable developer tools to override what service is loaded into your application. Or in other words, you can test code on production without actually deploying to production. The common dependencies are now services that are independent from the application code. Because services are unversioned, the dependency structure is again flat. Each service can individually be deployed and be available to every upstream dependency. Obviously not all front-end code should be a service. Services have their own challenges. Specifically your code has to stay backwards compatible. But code can’t always be backwards compatible. Sometimes there needs to be breaking changes. The same problem exists for back-end services. A back-end API has to stay backwards compatible. Breaking changes on the back-end are generally solved by either creating an entirely new (versioned) API or implementing feature toggles within the API itself. The same solution applies to sofe services. An entirely new sofe service can be deployed or feature toggles can exist inside the front-end service. However it is solved, the key point is that services exist outside your application within their own distributable. Another potential problem for sofe services is performance. Because they are loaded at run-time, performance can become a concern if you synchronously load too many services during bootstrap. Performance degradation can be mitigated by asynchronously loading larger services after the application bootstraps. Despite these challenges, there are many benefits to services on the front-end. The most exciting thing about sofe is there is now an option for services in the browser. You can decide what should and shouldn’t be a service. Getting started with sofe requires only System.js. But to help you get started we have built sofe to work with a variety of technologies, including webpack, Babel, jspm, and the Chrome Developer Tools. Sofe is also actively used in production at Canopy Tax. We would love feedback on sofe and a number of open source projects that have been built around it. As you approach your next front-end project or look to improve your existing app, consider how it might benefit from service oriented architecture. Read more about how to get started with sofe here.